The Quickest and Easiest Way to Dust Any Surface! This is, quite possibly, the best dusting cloth available. It's not treated with any chemicals, and you don't have to spray anything down to achieve good results when you wipe with it, but it will perform better than any other dusting cloth you've tried. The dual sided technology provides long, fluffy fibers on one side, and a shorter, more traditional surface on the other. Each of the super fine fibers are split at the end to increase the cleaning power, and give this cloth the ability to grab and lift every last spec of dust as you wipe. As you run your hand across it, the cloth will feel sort of sticky to the touch because it's grabbing at your skin. This grabbiness is what makes it able to scoop up, and lock in dust with such efficiency. The high quality material, and clingy charge will make it seem like dust is pulled up like a magnet, and as you remove the grime, you will also be polishing the surface at the same time. Because this is a dual sided cleaning cloth, it will be perfect for dusting when using the fluffy side, but it can also be used for general cleaning by flipping it to the reverse side. The extra long fibers, and superior fabric will make it easy to wipe the dashboard of your car, eliminate dust from a TV, or clean off that neglected shelf. Stop chasing dust around your home due to the use of inferior products, and don't go another minute thinking that you need some expensive spray to remove dust and polish surfaces. This powerful dusting cloth will save you time and money as it allows you to make the whole job easier, and because it's totally washable and reusable, you can clean again and again without spending more money. DRY - Most people will only use this cloth dry. For normal dusting around your house, or in your vehicle, you will not need to prep or treat the cloth or surface in any way. Leaving it dry will give you plenty of power when removing dust, and it can also act as a drying tool when used this way as well. You can use either side when dusting with this cloth, but the longer fibers on the fluffy side will be better for picking up, and locking in all of those light particles. The more normal surface on the other side will still remove dust, but is probably better for polishing, or wiping down surfaces with less dirt on them. The thicker material can skim more surface area in a single pass, hold more debris, and grab and hold more little pieces of dirt thanks to the "sticky" split ends. Because this powerful dusting cloth works so well, you will be able to pick up loads of dust and dirt without smearing it around, or watching it fly through the air, and you will spend less time getting each area clean. The high quality fibers will lock in everything collected, and it will remain held until the job is done. Despite how well it cleans, this cloth will not pose any risk to any surface you use it on. The soft material will never scratch, mark, leave behind lint, and because you won't be using any dangerous sprays, you don't have to worry about what they might do either. Use the plush side dry to dust surfaces in your home, office or car, or flip it over and use the terry side for cleaning, polishing or drying. 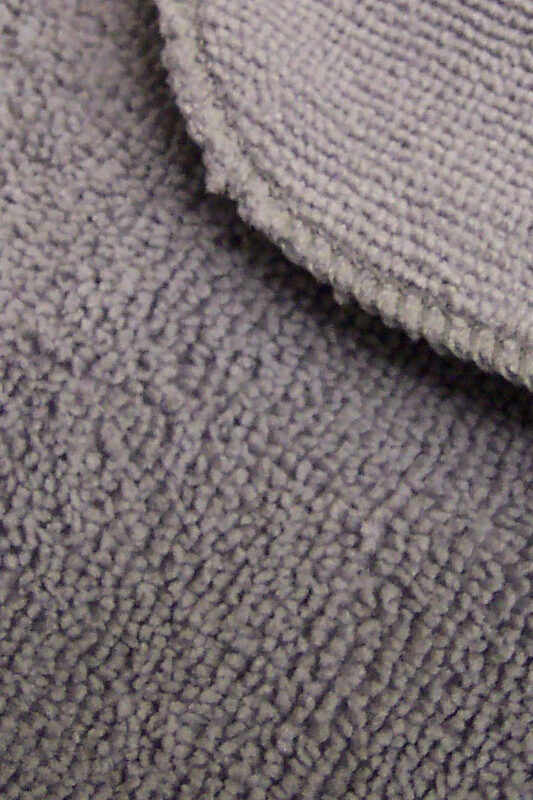 WET- More than just an incredible dusting tool, this cloth can also be used damp or wet for other jobs too. The side of the cloth with shorter nap is ideal for this purpose. Get it damp with water to increase it's cleaning ability or to polish wood, glass or metal. Once slightly wet, you can clean and polish almost any surface. Use it for windows and mirrors, or to detail your car interior. This versatile cloth makes it easy to switch from one job to the next because it has so many uses. Just a single swipe will remove 99% of all the dust and debris from any surface, and then polish it to a streak-free shine. No chemical sprays are necessary, so you can make surfaces shine without leaving streaks, and only using water as your detergent. Get better results than you could with fancy colored liquids, and spend less time and money getting it that way. Dusting wood, metal, plastic, vinyl, stone, etc. Safe for any surface type. Use in car to clean dashboards, instrument panels, radio face plates, seating, doors and more. Use at home to dust shelving, glassware, crystal, furniture, light fixtures, sconces, appliances and more. Use at the office to dust keyboards, wipe down desks, clean counters and more. When damp it can wash windows, clean mirrors, remove stubborn dirt and more. Dust, clean and polish at the same time. Do so without any chemicals. Discover one of the fastest and easiest ways to dust any surface within reach, and not only will you be eliminating the dirt, you will also be polishing the cleaned surface all at the same time. Many spray on dusters will smell like they are working, but they are incapable of producing better results than this cloth will deliver. Plus, those sticky sprays leave behind a residue that only attracts more dirt quicker. This one allows you to eliminate the cost and environmental hazard that spray solutions create, and you will be able to do it without any compromise to cleanliness. The unique fabric that this cloth is made from will do all of the work for you, so dusting sprays and other cleaners are no longer necessary. It is comprised of thousands and thousands of teeny tiny fibers that spread out and skim the surface you are dusting. As you clean, a static charge will also be created to combine with the "stickiness" of the super fine fibers, and increase the cleaning power. The combination of this charge and the high quality micro fibers will make it easy to quickly clean any surface, and completely remove all dust in a single pass. The plush side picks up more dust than any other microfiber cloth, while the reverse side allows you to perform other cleaning tasks too. This incredibly versatile dusting cloth is perfect for a number of applications and will make dusting anything much easier than the traditional methods you are using now. You will be able to get better results in less time, with less effort, and at a much lower cost. Receive discounted pricing when you buy more than one in a single order. Uses Clean, dry, dust, scrub, wipe down, polish and more. A versatile cleaning tool that offers high absorbency, and powerful cleaning abilities. Where To Use Safe for any surface. Will not scratch, and no chemicals needed. Machine Washable Yes - Machine wash, tumble dry low. Do not use fabric softeners or bleach. A top of the line cloth that does the tough work for you. This extra thick rag is constructed with specialized fibers that pull in dust and other particles like a magnet. One swipe will completely clean and polish any surface. Order Yours Today! Previously I was using the Swiffer disposable dust cloths which are way too perfumey (what sense does it make to perfume a dust cloth?!) I found this one through a Google search and am very happy with it. It's washable and not perfumed thankfully. Seems to do a good job attracting the dust and not just sliding it around the surface. I prefer using washable cloths and not disposable for all cleaning tasks. I will probably get another one. Maybe other people have different kind of dust that I do! These cloths seems to just move the dust around and did not catch all of it, i.e., corners etc. I'm very disappointed. I like these cloths, they are large enough and not too big. Easy to wash and durable. Haven't used yet. Appears to be great quality. I bought 4 of these to add to my other microfiber cloths. This is a great product! I use my other ones for regular cleaning and to really dirty up, but these I only use for dusting and they work great. My entryway is dark hardwood and it shows every piece of dust, lint, and cat hair. It drives me crazy trying to clean it-- brooms and dust mops just push the debris around. I tried the micro-fiber cloth and it worked wonders-- picked up all the specks and they stuck to the cloth for easy removal. Would definitely recommend. There is not much to say about this. It's a dust rag. I have noticed that compared to a cotton rag, it does not leave the lint behind that a cotton rag would. Works well on TV. But I don't like the feel of it. Even the slightest rough hands are going to "stick" to this rag. I agree with the product description that this is quite possibly the best dusting cloth available! It was like a miracle to clean our windows with it, the dust and dirt simply left the window and stuck to the cloth. I can't say enough good things about these cloth's, I will never be satisfied with any other method of dusting that doesn't use this microfiber cloth. 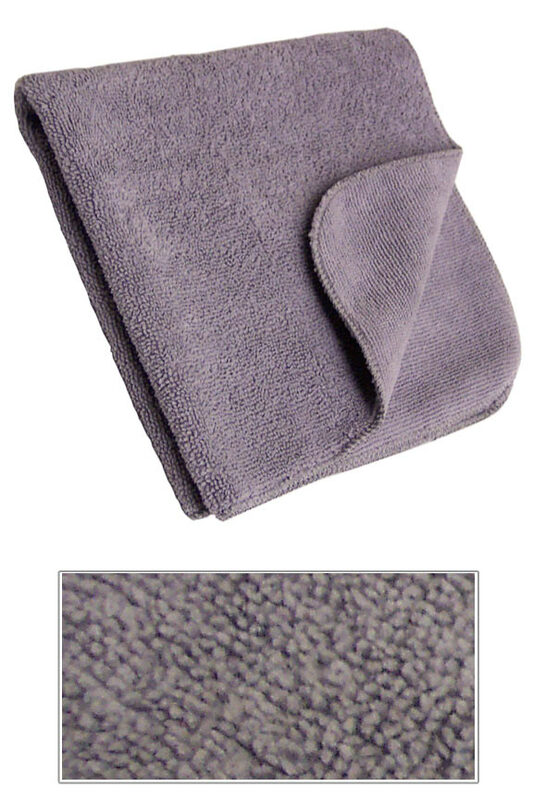 No Lint when using this Microfiber cloth. The first thing I used was to damp dust my black electronic such as tvs. Usually with other cloths, even after wiping I would still see traces of lints. Not with this one. I used it to wipe my front door glass and I just wet it a bit and it cleaned it without chemicals. I have learnt from bad experience not to wash these cloths with terry materials. I basically wash it by hand and air dry. Do not use fabric sheets when drying this in the dryer. It will lose the static charge. I just used this cloth for the first time. My furniture looks as if I polished it. What is the length and width of this cloth? This one is a larger 16" x 16" cloth. Use unfolded to clean large areas in a single pass, or fold into quarters for a fluffy pad and more clean surfaces to switch to. Just refold to reveal a fresh square. 6 of 7 Customer(s) found this Answer helpful. Can you wash and use it again? How long does it last? A single cloth will last for years. Most people will wash them hundreds of times before replacement is necessary. 4 of 4 Customer(s) found this Answer helpful. I read about your dusting cloth, but it doesn't tell me what to do with the cloth after you finished dusting. Do you have to wash it everytime you use it in the washer and dryer, or can you simply just rinse it under the faucet to remove the collected dust? Little confused about "after dusting." Thanks for you help. You do not need to launder it after every use. In many cases, you can just shake the dust into a trashcan, and in others, you may want to rinse with water and hang to dry. When it get thoroughly soiled, then you'll want to machine wash with regular detergent. Yes we do. Just give us a call to set it up. 1 of 2 Customer(s) found this Answer helpful. Perfect For Scrubbing or Drying. Use in the Kitchen or Bathroom. Fast and Safe. Chemical-Free Cleaning made Easy! Three Cloths to Keep Your Entire Kitchen Clean. A Fast & Easy Way To Clean The Screen On Your iPad Or Other Tablet. Buy More And Save. Top Quality Material Ensures Fast And Thorough Cleaning.